He looks everywhere-in his cupboard, underneath the floorboards-even in his walls. But while he's busy tearing his house apart, he doesn't notice one tiny, squeaky, mouse-shaped detail. . . . Will Owl ever get a good night's sleep? Greg Pizzoli is an author, illustrator, and screen printer. When not making picture books, Greg can be found seeking out strange noises at his studio in Philadelphia. 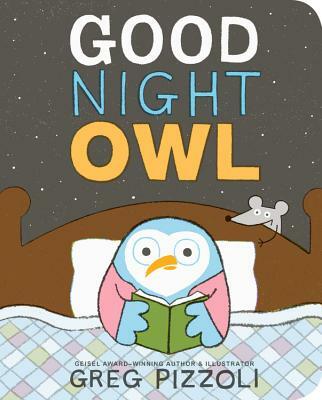 He is the author of Templeton Gets His Wish, Number One Sam, The Watermelon Seed, which received the Theodor Seuss Geisel Award, as well as the picture book of Good Night Owl which was a 2017 Theodor Seuss Geisel Honor Book. Visit him at www.gregpizzoli.com.